A film was recently released about the controversy surrounding anti-Semitism in the British Labour Party and the expulsion of Palestinian solidary activists from that party, who were accused of anti-Semitism, and how this is embroiled the whole body politic in Britain. The film, called Witch Hunt, was directed by our guest, John Pullman, and is supported by the organization Jewish Voice for Labour. 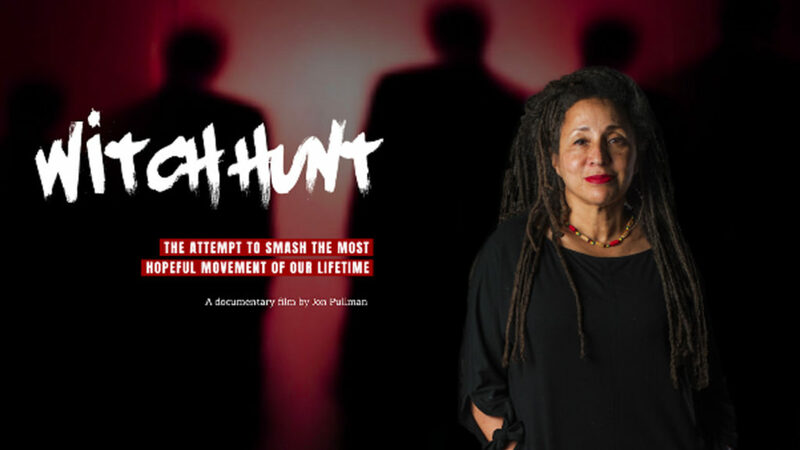 At the center of the film is the story of Labour Party activist Jackie Walker, who is black and Jewish and a member of Momentum, which is a movement which helped propel Jeremy Corbyn into the leadership and becoming the leader of the British Labour Party. She was expelled from Labour, and later reinstated, and was also investigated twice by committees within the party for anti-Semitism. Here’s a short segment from the film, it’s actually from the trailer. SPEAKER: At least one case, that’s of Jackie Walker, that’s been shown to be unfounded, and so Jackie has been reinstated. And in her interview on the Today program, it became clear that her private conversation was taken completely out of context. JACKIE WALKER: You start to begin to think, what is going on here? A party system which is encouraging a kind of Stasi-like sort of informing about people. MARC STEINER: And we are joined by the film’s director, John Pullman. So welcome to The Real News, John it’s good to have you with us. JOHN PULLMAN: Good to be here. MARC STEINER: So talk a bit about this film. You’ve been a filmmaker for a while. You were based in Scotland, you’ve traveled across the Middle East, you’ve done a number of films around Israel and Palestine, a lot of short documentaries, including Children in Chains: The War on Palestinian Prisoners in the West Bank, and The Forgotten, which is about Palestinian refugee camps in Lebanon, that you visited. But now you’ve come kind of full circle back to Britain, where you’re from, and created this film. Tell me why, I mean, what kind pushed this film witch hunt? And let me just say, you can see it at WitchHuntFilm.org, free to the public. But talk a bit about how this came about. JOHN PULLMAN: I mean, the situation in British politics, how it’s developed now, is really impossible to ignore. As you say–I mean, I’m an activist, really, particularly interested in the plight of Palestinians, and all my films up to now are really been based around raising awareness, public awareness, of the issues on the ground there. But the way that the politics has evolved in recent years is impossible to ignore. Clearly, the main trigger for this was the election of Jeremy Corbyn to the leadership of the Labour Party. And I believe attempts to stifle criticism of Israel or to raise awareness about Palestinian issues has been that there for a couple years, but this particular acute development on attempts to stifle Palestinian voices is impossible to ignore. The final deciding factor for me was that the narrative about anti-Semitism within the British Labour Party was uncontested in the public space. Not only was a counterview of the mainstream media being denied, but it even felt forbidden to suggest there was another counterview. So even though I’m just a grassroots activist, I felt if the mainstream media or other production companies with a budget aren’t prepared to take this on, then someone has to, and that appears to have been me. MARC STEINER: So what is the role of Jewish Voice for Labour in this? Does this have anything to do with your ability to allow the film to be seen for free? I mean, talk about that just for a minute. JOHN PULLMAN: I mean, I met Jackie Walker a couple years previously in Edinburgh where I live. She was doing a tour at the time and she was refused a public venue to have that tour, so she was making the making the event happen on the steps of a church that she’d had the doors closed on her for. But I met her separately and began to develop a film. I mean, I develop zero-budget budget films, so I just had an interview with her when I was developing the film. It’s the home. I’ve got colleagues at Jewish Voice for Labour, I showed them some of my work, they realized what I was wanting to do with the material, they realized that some of the material was quite strong, and decided at that point to support the film. I mean, and it is worth saying, it still was zero budget in a sense. I mean, we raised a bit of money to help hire venues and so on, but it’s really been the moral support and the additional hands-on-deck for publicity and so on which has really made all the difference. I mean, without Jewish Voice for Labour, there’s no way the film would be gaining the impetus it is now. MARC STEINER: Let’s talk a bit about what the film gets into at the heart of some of the things here. And I’m very curious why you think what’s happening internally inside the Labour Party, why there’s so much controversy around this and why people are actually being investigated inside the party, as Dr. Walker said, almost like the Stasi of East Germany, what that’s about, and the role that you see that the Israeli Ministry of Foreign Affairs plays in all this, this huge international battle taking place. I mean, anti-Semitism is real and deep. What do you think–before we get into some of that–what is happening inside the Labour Party allowing this to happen? JOHN PULLMAN: Well, you have converging interests here, don’t you. I mean, certainly there have been coordinated efforts by the Israeli government and its embassy here, and various supporting groups, to undermine activism around the issue for years. I think Corbyn’s election as the leader of the Labour Party was entirely left field. I mean, it was out of nowhere. I don’t think anyone expected this guy to get in, and the moment he did, there was a concerted effort from lots of directions, not just from the Israeli government, who were alarmed at Corbyn’s pro-Palestinian principles, but from the right wing of the Labour Party, which has definitely been moving to the right over many, many years. And so, I think you could understand the attempt to undermine Corbin’s basic support base is as much about destroying the left of the party as it is chilling speech on Israel, although clearly, that feeds into the interests of people that definitely do want free speech on Israel to be chilled. So you have a convergence of interests here, and I think the very particular nexus of that is what has given rise to this really quite spectacular witch hunt, really, within the British Labour Party. I mean, it’s become very dirty, very dirty. MARC STEINER: So let’s start listing some of the contradictions here with this. And I’m going to play a short clip here for you, I think Stephen Marks is his name, his very kind of humorous take on the Labour Party, with the Miliband brothers, both Jews, fighting for the leadership of the party, and what anti-Semitism is. Let’s take a quick look at this. MARC STEINER: So now that we’ve seen that–this was humorous and I enjoyed that little clip and he’s seems a very funny man, but at the heart of this is something very serious. Because this is where the contradictions–what it seems like people in your film are trying to do, especially the Jewish members of the Labour Party, are wrestle with these contradictions, which is no easy trick. How do you see that playing out? JOHN PULLMAN: I think it’s important–I mean, one of the important aspects of the film is to demonstrate to people that voices against the criticisms of Corbyn, voices in support of Corbyn, voices who criticize Israel, are not all coming from one direction, that there’s a very legitimate Jewish voice that rejects the attacks on Corbyn and rejects the attacks on pro-Palestinian supporters. I mean, most of my work takes me into cooperation with incredibly determined and principled British Jewish activists. And I think the important thing for people to understand is that there clearly is an uptick in anti-Semitism in the Western world at the moment. A lot of right wing governments are beginning to emerge, quite worryingly so, and there are far right groups that are becoming stronger and more confident. And some of the age-old prejudices against Jewish people are beginning to reemerge. And I would certainly think it’s important to acknowledge that as anti-Semitism emerges again, there will be pockets of people who consider themselves to be on the left of politics to have those views. What we have to call out is the attempt to paint the left in general, and the British Labour Party in particular, as being full of these sorts of people. This is where we have to be clear. MARC STEINER: And just very quickly, there’s another quick clip I want to play that has to do with a British woman who’s a member of the Labour Party. Her last name is Levane. And then an interesting interchange between the Chief Rabbi Sacks and another Jewish activist. And let’s take a quick look. MARC STEINER: So for me, this was important. Because she clearly points out that part of this is the contradiction of the rise of the right, but it’s being used to slam the left, which I find interesting. And then there’s this continuing battle over what Zionism and anti-Semitism mean, and the intersection of these two. That’s why this becomes such a complex subject, I think, for people to tackle, both viscerally and intellectually. And this is what you’re attempting to do here, is to parse this out. JOHN PULLMAN: Sure. I mean, the film admittedly tries to cover a lot of ground in its 62 minutes, but I think it’s important that the whole picture is at least pulled together so people can see the connections between different things. And this discredit of Corbyn supporters to undermine pro-Palestinian voices, part of the things playing into that or feeding into that are attempts to redefine what anti-Semitism is. And the new definition is certainly gaining ground, and Britain and other countries in Europe seeks to conflate anti-Semitism with anti-Zionism. This is something the film tries to demonstrate, to say that people who are against Zionism, which is an ideology, effectively, is anti-Semitic is clearly wrong. But the film also tries to explore what Zionism is. I mean, I think an awful lot of people out in the broader world are really confused by all of these things. And I think especially [inaudible] to understand what we mean by Zionism, and the film does try to do that as well. And Zionism is an ideology, it’s the ideology that was behind the creation of the state of Israel in 1948. And I mean, it’s a political system, it’s a base of beliefs. And I think that once we get to a point where people are not allowed to have open discussions about this ideology and where it’s led, then we’ve got very serious threats and problems with regards to free speech. MARC STEINER: And finally, I just want to very quickly comment here. The film, as I understand, was banned from being screened to the British parliament. A, is that true, and B, had there been other ramifications? Unfortunately, the MP was suspended anyway. But I think that this is just another, in a sense, selling point for the film. We need to say to people, “Why is a film like this, which merely seeks to raise important questions, being banned?” And this is really the kind of line we’re taking now. This is a film that everybody that seeks to have an opinion on this issue really needs to see and have a discussion about some of the issues that it raises. MARC STEINER: Well, John Pullman, I want to thank you so much for being with us, and let our viewers know that they should go to WitchHuntFilm.org and see the film in its entirety, which we’ll of course link to on the site here but you can also just go there. And John Pullman, thank you so much for joining us. It’s been a pleasure to talk with you, and good luck with the film. JOHN PULLMAN: Thank you, Marc.